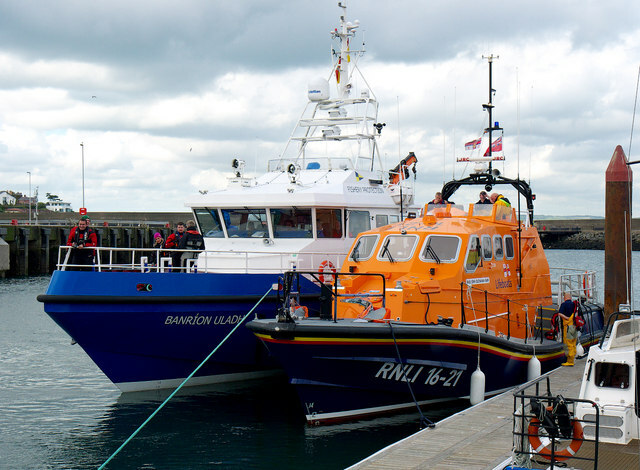 Current Portpatrick Lifeboat Link 'John Buchanan Barr' alongside the Fisheries Protection vessel the 'Banríon Uladh' Link at Bangor harbour during Exercise Diamond. The various vessels involved in the exercise landed 'casualties' to Bangor throughout the exercise. The 'John Buchanan Barr' Link is a RNLI Tamar class lifeboat Link .